With the rise of the internet, the sale of traditional holiday postcards is in decline. This lovely card was published by the Borestone Committee in 1907 and would have been sold at the Borestone Hut on the field of Bannockburn. 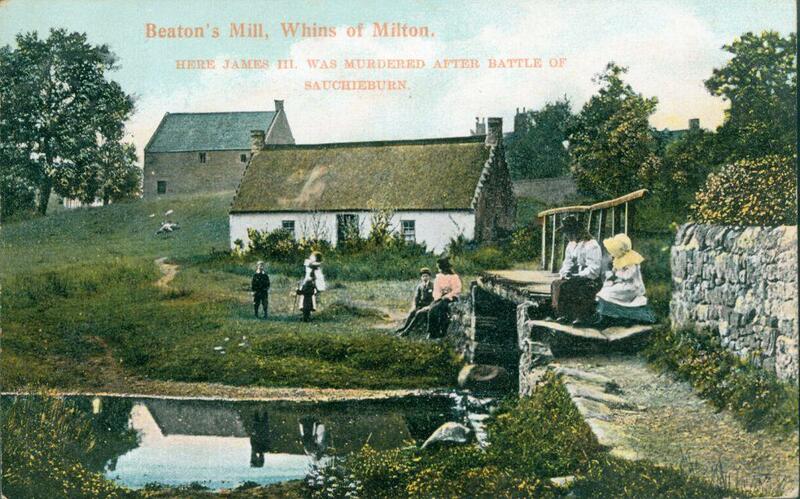 Visitors often explored both Bannockburn and nearby Beaton’s Mill, the place where James III was assassinated, after the Battle of Sauchieburn in 1488. This rising against the monarch, by nobles dissatisfied with his performance and associates, was headed by his 17 year old son, who became James IV after his father’s murder. The injured James III had sought refuge at the mill after the battle, and asked for a priest. One of his opponents, posing as a priest, stabbed him. He was buried with great ceremony at the Abbey of Cambuskenneth, and his son was so full of remorse, that he wore an iron belt for the rest of his life, adding weights to it in penance, each year. In the 1850s, the cottage beside the mill was occupied by a nail-making family, who showed visitors the various parts of the mill machinery, allegedly from the time of James III, on request. The mill was burned down by vandals in the 1950s, and the picturesque spot has gone. The card is from a collection made by the late John Wilson, President of the Stirling Philatelic Society, and loaned by Mrs C. A.Wilson.